Things have been rather crazy lately, and as such I haven't really had a whole lot of time to be inspired to write about something new and interesting to me. So instead, today I'm going to take a look back at a topic I found very interesting earlier this year. Several years ago now I played and fell in love with Grandia 2, and so I've always meant to also play the original game in the series. Earlier this year I did just that, and looking at it with a critical eye, I found some pretty interesting aspects to it's game design. Strangely enough, they are almost all things that are missing from the game's sequel. 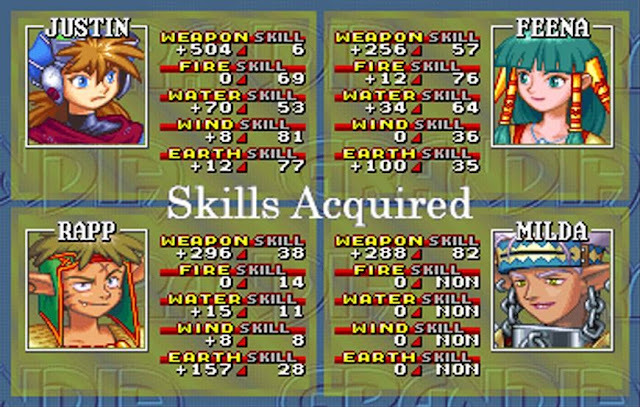 So today I am going to talk about what I found while playing Grandia. Now pretty much every aspect of the game's design that intrigued me has to do, at least in part, with the game's proficiency system. So to begin with I shall describe what said system looks like. Basically, every character has a set of weapons that they can use (for example, the protagonist can use swords, maces and axes), as well as the ability to use each element of magic. To unlock elements you have to find mana eggs, then decide who to give them to and what element they should learn. As a character uses a specific weapon or element, they gain skill levels for that weapon/element. This does 3 things. The first is, upon reaching certain levels of skill with the right weapon/element, you can learn new spells and abilities. Additionally, every weapon/element has certain stats associated with them which will increase when you gain a skill level (eg. increasing axe proficiency will grant str+2 and hp +1). Finally, I'm fairly certain that increasing your skill will also increase proficiency with that source. In other words, more sword skill = more damage with swords. I don't really have any proof aside from anecdotal evidence and it being logical, but it really doesn't matter one way or the other. So it's a pretty neat system, nothing ground breaking, but neat. 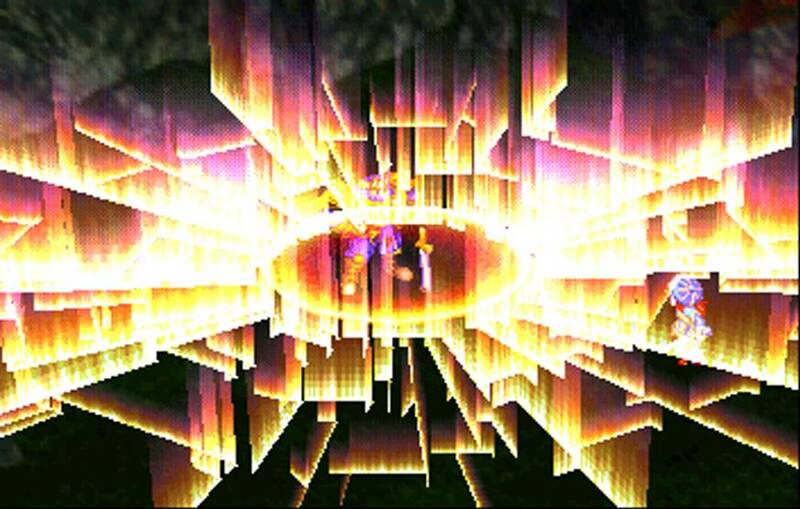 It has some neat effects on the game though, and permeates pretty much all of the gameplay systems. To begin with, it gives the player some level of choice. Do you beeline new abilities? Do you try to minimize a characters weaknesses by focusing on weapons/elements that provide stats a character is lacking? Do you use weapons/elements that enhance a characters strengths? Do you mix it up? Do you just not care? Realistically, most players aren't likely to focus on a specific weapon/element for a long period of time. The game shows you what proficiencies you need to learn what skills, so most people are likely to want to check those abilities off the list. Other people probably won't care much and just use whatever weapon is the strongest, which is fairly varied throughout the game. Finally, if you focus on one proficiency too exclusively it becomes prohibitively hard to level it up further. Ultimately the chances are quite good that players will mix it up, but there is still at least a strong illusion of choice there, which I find makes things a lot more enjoyable. I found that while playing through the game, my proficiencies were something that was constantly in the back of my mind. I'm the type that likes to customize and plan things out long term, and I got a bit of a kick out of planning "ok, I'm going to use this weapon until skill level x, then switch to this weapon until y so I can learn ability z". It has a big effect on the game from battle to battle, too. See, I'm also the type who tends to hoard MP and items big time, you won't find me unprepared for all the surprise boss battles that may or may not come. With this proficiency system I felt way more compelled to use skills and magic though. They award more proficiency, and that is something I want. Of course it helps that almost every boss has a save/heal point in front of it, so I can feel safe knowing I'm not squandering my MP or SP. There is something to be said for rationing your MP through a dungeon, but I feel that being able to go more or less all out ever battle is still more fun. It's not like heal points mean you have infinite HP/MP/SP either. 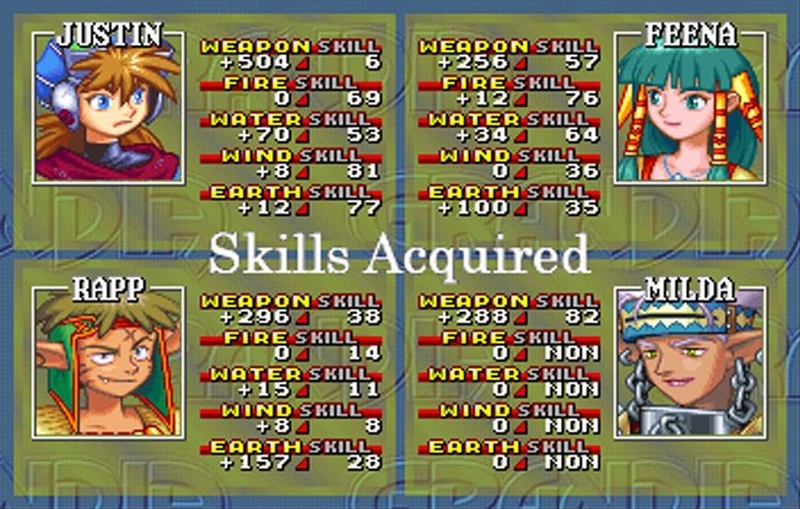 Grandia strikes a good middle point where you want to use your skills and abilities when they are going to be most effective, but you are very much encouraged to use them often. Finally we have your party members. I feel like the industry has never really come to a consensus on what is good practice as far as how many playable characters you should have, how often they should change, how free you should be to customize your party, etc. There are several examples of successful games that do it in a variety of different ways. 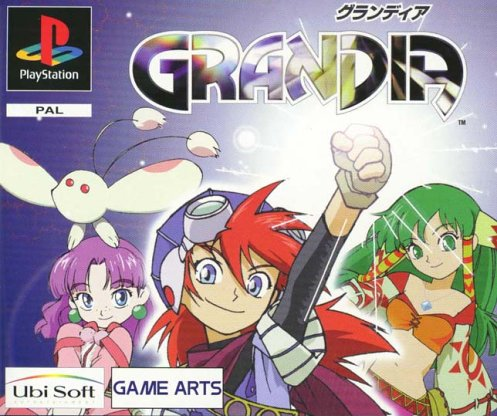 Grandia is not one of them, however. It goes a bit like this: There are 8 playable characters. 2 of them are in your party for most or all of the game. 1 is in your party for about the first half. 2 are super powered and are only around for a short while. 1 is "meh" and around for a very short time. 1 is "meh" and is around for about 1/3 of the game. 1 is quite good and is around for a very short time. What does all that mean? Well for one, most of the cast is not around long enough to really care about them at all. In a game with this proficiency system that extends into battle, though. See, if I don't care about a character, and it's pretty obvious they won't be around for long, I'm not going to bother using them. Any attack they do equates to proficiency that could have instead belonged to a more permanent character. I made a point of not using temp characters in battle, even against many of the game's bosses. 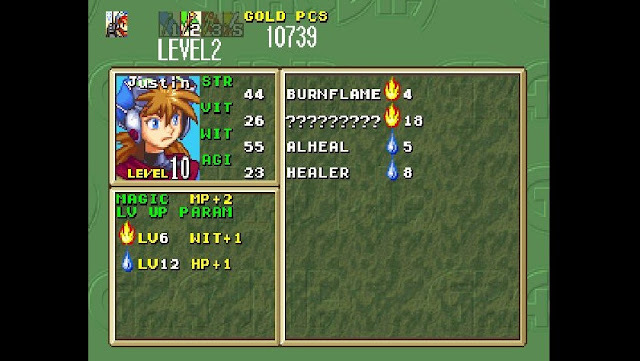 This problem is remedied a bit in that, when a character leaves forever you can award a portion of the proficiency they gained while in your party to another character. However it's only a portion. What's more, in the case of the "super powered" characters, their proficiencies go up so slowly that you aren't likely to get much (if any) proficiency from it. It more or less works for the other characters, but the fact still remains that I don't care about these characters at all. The main 2 characters you craft from the ground up. These short term guys come at a certain level of proficiency and you don't really ever get a chance to play with that much. It's just not fun using them. So to me, the take away from all of this is that a) you should let the player heal and save before bosses (a bit of a no-brainer anyways), and incentivizing the use of abilities is really important. The standard MP system has it's merits, and there are certainly a lot of games that do a good job of incentivizing ability use. Nonetheless, the fact of the matter is that far too many games make me feel like I need to stick to cheap/free attacks and save the big guns for the boss. I find games that break free from that mold tend to work pretty well (to me anyways). Also, choice is huge. I probably care a lot more about customization and long term planning than most gamers, but I think it's still something anyone can appreciate. When you craft a player even a little bit, you feel attached to it. Even if those choices ultimately have little to no effect, the illusion is still attractive.